We’d originally planned a Thai-style stir fry for this evening but I couldn’t muster up much enthusiasm for it. I came across an idea for this dish while browsing online and was instantly more excited, not least because it included pea shoots. We haven’t cooked with them much before, bar one failed attempt to recreate a restaurant-style dish and using new ingredients is always much more fun than relying on tried and tested favourites. We were both really pleased with how this turned out: the combination of mirin and soy sauce providing a really rich, earthy flavour while the mustard dressing lightened and lifted the whole dish. The delicate pea shoot flavour was a bit lost really but was definitely better than something like rocket which would have been too peppery, or general salad leaves which would have been lost even more. Whisk the mirin, soy sauce and sake together. Fry the steaks for 2-3 minutes per side. Remove from the pan and rest. Pour off excess fat from the frying pan, then add the mirin, sake and soy sauce mixture. Bring to the boil and simmer for 2-3 minutes, until thick. Return the steaks to the frying pan and cook for a further minute, continuously spooning the sauce over the steaks. Mix the salad, combine the dressing, dress the salad, add the steak and serve. 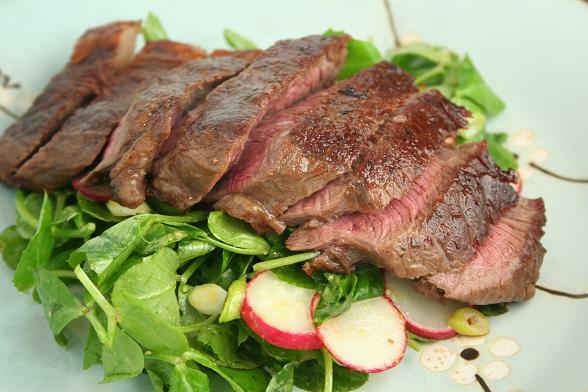 Subscribe to comments with RSS	or TrackBack to 'Teriyaki Steak with Pea Shoot Salad'. Lovely picture. Most teriyaki recipes I’ve seen use some sort of sugar element like honey. I guess because yo’ure cooking the steak at a high temp it might burn? Thanks Lizzie. Although it didn’t have sugar or honey in it, it was still quite sweet from the mirin. Now! This is interesting! Teriyaki steak cuz I usually associate teriyaki with salmon. That looks lovely – I always get angsty when Mr F doesn’t fancy what I’ve planned to do! I love the colour of the beef, looks perfect! This is just my sort of dish – I love the flavour that mirin gives. May well need to try this soon – thank you for the recipe! I haven’t had raw pea shoots as a salad before. Sounds interesting. I would have tried a miso-wasabi dressing, to match with the Japanese-inspired steak sauce. I hope you like it, Antonia! The contrasting flavours worked well I think, Nate. We did talk about wasabi but this was pretty similar.